VFC Avalon Gladius (Urban Grey). 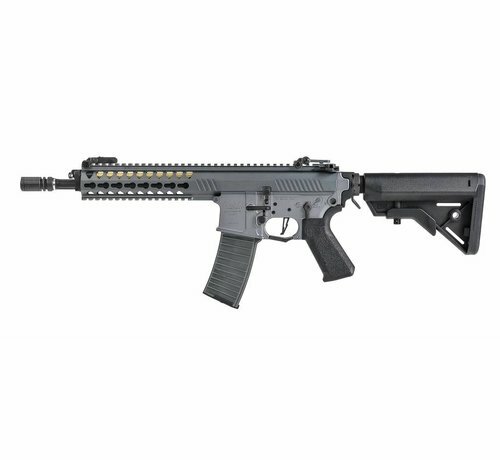 VFC Gladius DX, comes with full metal body and high quality Avalon engravings. The extendable Crane stock allows you to adjust the length of rifle to fits your body! Comes with a 120 round KAC Style Mid capacity magazine. Metal flash hider can be screwed off for installation of a 14mm clockwise threaded silencer, just like the Marui M4A1. Dust cover can be flipped open to reveal hop-up adjuster. Ambi Selector and Mag Release as standard.. The Avalon Gladius DX internals include the new ECS gearbox and strong magnetic motor, match grade hop rubber, precision inner barrel and CNC machined air nozzle as well as a MOSFET electronic control unit for faster trigger response and battery management. It has a keymod rail system with with a monolithic top rail, One piece upper receiver / RIS with no wobble, enhancing the speed of sight picture acquirement. 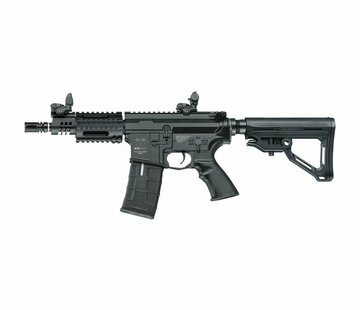 The Avalon Gladius include VFC's QRS and Crusader Tech accessories allowing user to adjust the rifle to individual shooting style and users friendly for both left and right hand shooters. Foam Padded Hard Case Included.